While homes seem to lend themselves naturally to Christmas decorations, decking out a building can seem like an insurmountable challenge. It’s not. The key to effectively decorating buildings is to ensure you match the size and scope of the building with the décor. Check out some ideas on different ways to decorate buildings we put together here at Christmas Night Inc.
To truly make a statement on the exterior of the building, you typically have to go big and bold with your outdoor Christmas décor. You want to think in feet, not inches, and you also want to go larger-than-life for larger buildings to make the greatest impact. Large lighted signs aren’t the only way to make a significant impact when decorating a building. Other wire-frame signs featuring a series of light depicting different shapes are likewise available. Choices include stars, wreaths, lamp posts with ribbon, Santa Claus, elves, reindeer and other holiday themes. If your building has a front courtyard or other outdoor areas you want to decorate, large figurines are a notable way to do it. Life-size figures of Santa Claus, carolers, reindeer, elves and snowmen are all options, as are Christmas figures that double as outdoor benches or seating areas. Suspending an outdoor Christmas wreath in the center of the building’s face is another way to make an eye-catching statement. If one large wreath still feels lacking, you can choose several wreaths to display on the exterior in key locations. Smaller wreaths work well on exterior doors and planters, especially if they’re outfitted with lights and bow. Outdoor garland is another option for festooning the face of the building. It can also be used around the main entryway and exterior planters as desired. Use a thick, hearty, outdoor-rated garland that can stand up to the elements. You also want to use enough of it to create a lush look that stands out against the rest of the building’s façade. Garland can also be accompanied by lights, ribbon and bows to further enhance the look. Having a well-adorned building exterior sets up the expectation that your building’s interior will be equally as fascinating. Placing stunning Christmas decorations in the reception area, lobby and any large front windows will ensure you don’t disappoint. A Christmas tree near the reception area in front of the main desk automatically adds holiday spirit, as does hanging a wreath on the wall behind it. Other options can include hanging a row of stockings or garland along the front edge of the desk. Lights can be included on the tree, wreath and garland to bring an even warmer look to the display. Reception areas are also prime spaces to display poinsettias, which can be arranged in groupings for a spectacularly lush look. An expansive lobby and high ceiling are characteristics of many office buildings, creating the perfect canvas for large-scale décor. Suspending decorations from the ceiling can look particularly stunning, especially if you choose large-scale lighted decorations that match with the scale. A collection of large, lighted stars can be suspended at different heights throughout a high-ceiling lobby for an exceptionally dramatic effect. Large staircase banisters can also be wound with lights, with or without thick garland and large-scale red velvet ribbon and bows to add color into the mix. Don’t forget the large-scale holiday figures. You can choose from the same selection of large Christmas statues available for outdoor use, or you can opt for those specifically designed to be used indoors. If the front of a building has large glass windows, the area is ideal for a large, eye-catching centerpiece suspended in the middle of it. A single massive wreath could work, especially if it’s decked out with ribbon, lights, ornamentation and a bow. For a more streamlined look, you could opt of a lighted wreath display that features a wire outline of a wreath highlighted with multiple LED lights. Other lighted shapes or figurines can work in this large area as well, either suspended from the ceiling or placed directly on the floor facing outward from the windows. With all these ideas of different ways for decorating buildings, you have a sensational starting point to move forward. Feel free to use as many of these ideas as you like, mixing and matching them as you so choose. Decorating buildings for Christmas can make the workplace as warm and welcoming as the home during the holiday season. Check out the selection of holiday decorations at Christmas Night Inc. for even more inspiration. Holiday parties are joyful times to begin, but you can turn up the amusement level even further with fun Christmas games. Christmas Night Inc. gathered up a host of different holiday-themed games that can have you and your guests laughing in merriment all night long. This fun Christmas game invites participants to guess the name of a carol based on a line from the song. Have one guest say any line that comes to mind, such as “Had a very shiny nose.” Other guests must then guess what carol the line comes from. The simple example above comes from “Rudolf the Rednosed Reindeer,” but you can make it as easy or as challenging as you wish. Whoever guesses the song correctly gets to present the next clue to the crowd. If remembering the words to Christmas carols becomes too taxing, you can play an alternate version of this game by having someone hum part of a Christmas carol as the clue. This game is a fun way to tally how much holiday spirit is in the room. Have someone go around with a piece of paper to use as a scorecard, giving out points for each accessory or article of clothing in their outfit that showcases holiday spirit. You can give one point for each item, or adjust points accordingly. Someone wearing holiday socks, for example, could get two points. A holiday pin could be worth one point. And if any guests show up in an ugly holiday sweater? At least five points would be a good score for such a grand display of Christmas spirit. Similar to building a house of cards, this game engages guests in building a castle of marshmallows. Put a plate in the center of the table, then have each guest put a marshmallow on the plate when their turn comes. After the bottom layer of the plate is full, they’ll have to start building a castle on top of the marshmallow foundation. Keep the game going as long as possible, until the castle topples from someone’s marshmallow placement. That person, alas, loses the game. Christmas charades follows the same format as the traditional charades game, but with a holiday twist. Guests here have to act out a Christmas-related scene, character or situation without speaking. Examples include pretending to be Santa, a reindeer, or acting out parts of a song. “The 12 Days of Christmas,” for instance, has a slew of different lines someone could use as the clue. This game involves a person answering a question with two true statements and one false statement, with participants having to guess which statement is the lie. The Christmas version of this game uses the same format, but with holiday-themed questions. Let’s say the question is, “What was the worst Christmas gift you ever got?” The player would then name three horrible Christmas gifts, two that he actually received and one that he never received but sounds believable enough to fool the other participants. Those who can spot the lie get a point on a rolling scorecard. Sometimes a crowd needs some warming up, particularly if it’s a Christmas party where guests don’t know each other all that well. Holiday Guess Who is a terrific way to go about it. This game involves a list of holiday-related facts about people, and guests have to find a person who matches up with the facts. Find a person who can name all eight reindeer. Find a person who has re-gifted three or more Christmas gifts. Find a person who is wearing holiday socks. Find a person who has dressed up as Santa Claus at least once. Use your imagination to come up with facts that are straightforward or outlandish as you wish. With so many fun Christmas games at your disposal, you can bet your holiday party will have nary a dull moment. You can also bet your guests will thoroughly enjoy getting to know each other better while making new memories for many Christmases to come. Feel free to check out the holiday decorations at Christmas Night Inc. to add another layer of fun to your holiday get-togethers. One of the most fantastic elements of the holidays is all the glimmering, shimmering, brilliant lights, and you can create your own Christmas light show in your very own yard. These tips from Christmas Night Inc. outline how. Creating a rough yet accurate sketch of your yard gives you a bird’s eye view of how much room you have to work with. It also provides a working draft of all the different areas you want to cover. Once you have an overview of how much space you want to fill and elements you want to light, you can more easily assess how many larger light displays and what type of backdrop lighting will produce the most dramatic effects. Large light displays often come in animated versions, which is a fun option to consider for even more pizzazz. You can find lighted displays that measure anywhere from 6 feet to 68 feet wide, with the size you choose depending on the size and layout of your outdoor space. A smaller yard may do fine with a single, 6-foot Santa Claus LED light display, for instance, while a larger yard could use that same Santa as part of a larger display that also includes a 6-foot lighted snowman and a 12-foot lighted Christmas tree display. While your larger outdoor Christmas light displays will be the most prominent stars of your outdoor light show, you still want to provide backdrop lighting for the greatest impact. This involves strategic placement of outdoor Christmas light strands, light globes, rope lights and other smaller light fixtures. Outdoor light strands always look keen outlining doorways, windows and outdoor wreaths. Rope lights look particularly gorgeous wound around the trunks of bare trees, while strands can be draped throughout bushes and evergreens. Globe lights can be placed in darker areas that could use a brilliant boost, while laser projector lights can add a splash of vibrancy and color throughout large areas of the yard. Lighted icicles dangling from the eaves or tree branches can add another intriguing element. Landscape mesh lighting features small LED bulbs on a piece of mesh that can be laid over shrubs like a blanket. Whatever lighting you choose for your yard, make sure it’s rated for outdoor use. Go back to the initial sketch you made of your yard and indicate where each light display and different lighting element will be placed. This lets you ensure you space out the displays and lights in a uniform way to create a robust light show. It also lets you determine what other supplies you may need before you head outside for the installation. Pay particular attention to the length and amount of extension cords you may need to ensure every lighting element has a power source. Use only outdoor-rated extension cords, and connect no more than three strings of lights to a single outdoor extension cord. Once you have your sketch and supplies ready, it’s time for the big installation. Before you begin to haul everything outside, plug in all your different light strands, displays and other elements to ensure all of them are in working order. Don’t use tacks, nails or metal staples to secure any outdoor Christmas lights. Do use insulated hooks for light strands, and string lights tightly enough to avoid being blown off by the wind. Don’t hang decorations on light strands. Give them their own hooks secured to a stable surface. Do make sure all larger light displays are firmly secured to avoid wind damage. Either insert them directly into the ground or use a floor stand to display them on a solid, flat surface. Another big must is to ensure your main source of power comes from a GFCI outlet. GFCI stands for ground-fault circuit interrupter, and it shuts down the circuit if there’s an overcurrent. If you don’t currently have a GFCI outlet, you can have one installed by an electrician for future displays. In the meantime, you can purchase a portable GFCI plug that fits into your regular plug to provide protection. One final step after installation is to make your amazing light show as easy to manage as possible. Rather than having to manually turn the outdoor light show on and off each day, consider using an outdoor timer. Since you want to shut off the lights each night when you go to bed, you can set the timer to align with your bedtime to automatically shut off your display. While creating your own Christmas light show does take some planning and work, the results are always worth it. With hundreds of lights and eye-catching displays shimmering throughout your yard, your display is sure to instill instant holiday spirit in everyone who passes by. Check out the light displays at Christmas Night Inc. for inspiration any time. While giving Christmas gifts like socks and candies may be useful and delicious, neither one is going to be around for the long haul. Collectible Christmas gifts, on the other, can be enjoyed for years to come. Collectibles refer to gifts that are beloved, cherished, passed down through the generations, and may often align with a specific theme as part of a larger collection. We here at Christmas Night Inc. are big fans of collectible Christmas gifts of all sorts and sizes, and we gathered up the best collectible Christmas gifts to share with you. From minimalist angels crafted out of wood to sleek and shiny sterling silver, angel collectibles are as varied as they people who adore them. Striking ceramic angels, delicate glass angels and cherubic snow angels are all included in the variety of angels collectibles you’ll find the warm the heart of your gift recipient. Angels serve as much-loved symbols of protection which double as messengers of love, joy and peace. This gives them universal appeal for many, with different angel statues aligning neatly with different personalities and styles. If any of your intended gift recipients already have a miniature Christmas village or train set as part of their holiday decorations, gifting them with collectibles that match the set can be a welcome gift indeed. With so many different sets available, you want to make sure you know what collection they own so the pieces you give them match the same style and scale. For recipients who don’t yet have a winter village or miniature train set, you have the opportunity to jump-start their collection with any of the amazing pieces on the market. These range from miniature, lit-up buildings and homes to train stations and cafés. Again, make a note of which collection you selected so you can add new pieces to the growing collection year after year. Strong, sturdy and nostalgic, nutcrackers make delightful gifts that instantly bring on the Christmas spirit. They also have the added benefit of bringing on instant functionality when it comes to snacking on shelled nuts. Nutcracker collectible gifts range from the traditional wooden soldiers to themed collections that even include options such as a “Star Wars” and “Alice in Wonderland” theme. You can find a variety of heirloom nutcrackers as well as those representative of different countries and cultures, providing you with a vast selection of charming options. Whether your pal is a big fan of Charles Dickens’ “A Christmas Carol” or the tale of “Rudolf the Rednosed Reindeer,” you can find collectible figurines from a variety of classic Christmas stories. The figurines come in a variety of materials, sizes and styles, from the meticulously hand-painted and handcrafted statues of Scrooge to the adorable ceramic figures of Rudolf and friends. As with many collectible Christmas gifts, the characters make a striking statement when arranged along the mantel or near the tree as part of the holiday décor. And the collection can keep growing with additional figurines you can gift year after year. Like nutcrackers, you can find Santa Claus collectibles in a huge array of styles. The traditional North American Santa Claus sports the familiar red suit, black boots and jolly red nose, while the European version of Saint Nick wears a flowing robe. Quality Santa collectibles can be crafted out of ceramic, wood, glass or soft materials with a velvet or fabric outfit. The vast selection of Santa Claus collectibles means you can find a different Santa for every recipient on your list, one that matches their personality, style or existing décor. Opt for Santa on his own, with an overflowing sack of presents, or even perched in his sleigh led by eight prancing reindeer. Collectibles related to Santa Claus are another category you can explore, with figurines and statues that would be part of Santa’s North Pole home. In addition to the reindeer, you can find a wide range of elf figurines as well as items such as Santa’s throne, Santa’s mailbox and Santa’s hot cocoa café. While we covered what we feel are the best collectible Christmas gifts, there are many others out there from which to choose. You can even find life-size collectibles, with impressive nutcracker and Santa Claus statues that stand as high as 6 feet tall. Whichever collectible Christmas gift you choose, you’ll be choosing a gift that keeps on giving to keep the recipient smiling every time they see it on display. Check out the collectibles available at Christmas Night Inc. for even more ideas for Christmas gifts that make recipients smile. For those serious about holiday decor, Christmas decorations don’t stop at decking the halls. You are also likely to deck out your living room, kitchen, foyer and areas around your living space, both inside and out. While you may be tempted to use whatever holiday decorations you purchase anywhere you choose, you’re better off keeping indoor Christmas decorations inside the home. Christmas Night Inc. will tell you why. Outdoor Christmas decorations are designed for use outside in the elements, which means they need to be constructed using materials and finishes that are able to withstand the weather. Since they’re usually out in a larger space, they often need to be quite large themselves to make an adequate statement. One of the most common materials for outdoor statues or figurines is fiberglass resin. Highly durable yet lightweight, fiberglass resin works particularly well for larger statues and decorations that may otherwise be too heavy to easily move. Other base materials that are often used for outdoor holiday decorations include aluminum, wrought iron, wood and plastic. Although plastic decorations tend to be quite inexpensive, plastic is also the least durable material of the bunch. Wrought iron is hearty and heavy, yet it can eventually rust and may be very heavy to move. Wood is not a prime choice for cold and wet winters, since wood is prone to warping and rotting. Aluminum is an ideal choice for its light weight as well as its resistance to rust, yet you may not find the fanciest Christmas decorations using it. Outdoor decorations also require weather-resistant fastening methods, such as screws, nails and wire. Some will feature a single, solid piece crafted out of resin, rather than multiple pieces that need to be attached together and run the risk of being jostled apart. Quality outdoor Christmas decorations will also be sealed or protected in some manner to provide extra protection against the elements. Fiberglass resin statues and other figurines may be sealed with a weather-resistant coating. Wreaths, trees and other Christmas greenery for outdoor use may sport heavy-duty wire bases and branches, along with needles coated with a UV protectant to prevent fading from the sun. Outdoor Christmas lights will often indicate outdoor use on the label. If the lights were made in the U.S., you can also look for a red or silver and red label from Underwriters Laboratories, or UL, which generally indicates decorative lights are suitable for outdoor use. A green label or silver and green label from UL indicates suitability for indoor use. While outdoor Christmas decorations are more durable and stronger than those designed for indoor use, it doesn’t mean they are indestructible. You still want to take precautions when setting up your outdoor holiday decorations to ensure they won’t easily blow over – or even down the block. Staking or weighting down lightweight decorations is a good idea, as is placing or hanging décor in areas that are less exposed to the elements if possible. Covered porches and windows protected by eaves are typically good choices. Outdoor Christmas decorations can also be used indoors, as can a wide scope of other ornaments, light fixtures, statues, dolls and other holiday decorations. The selection of indoor Christmas decorations is typically much greater than outdoor decorations, and they come in a variety of sizes and materials that may never work for outdoor use. Because they’re protected in an interior environment, indoor Christmas decorations can be made out of pretty much anything. Choices range from Christmas trees made of feathers to life-size reindeers sporting fur-like material. You may still find some of the same materials used in outdoor Christmas ornaments, such as resin, aluminum, plastic and wood, but you aren’t be limited to that selection. The foundations and bases of indoor Christmas decorations don’t need to be as sturdy as outdoor decorations, either. While outdoor Christmas trees and wreaths may come with heavy wire foundations, indoor versions may have wire that’s not as heavy or durable. Many indoor decorations could be blown about with the slightest wind, with the materials easily faded by the sun, soaked by the rain or altogether ruined by the snow. While an outdoor Christmas statue may sport a solid base painted with weather-resistant paint, indoor Christmas decorations can include a host of different textures and finishes. Faux snow, faux fur, velvet, felt, glitter, metallic paint and other eye-catching fabrics and details are often found more commonly on indoor decorations. The wider range of materials is matched by a wider range of options for constructing them. Rather than sticking with only weather-resistant screws, nails and wire, indoor decorations can be held together with glue, fine stitching and other methods unlikely to last all that long in the great outdoors. To ensure you get the longest lifespan and beauty out of your Christmas decorations, it’s important to keep those rated for indoor use inside the home. Feel free to use your outdoor holiday decorations both inside and out, as they’re designed for durability against the elements. Also feel free to browse the vast selection of Christmas decorations right here at Christmas Night Inc. Despite the weeks of excitement and fanfare, Christmas can still sneak up on you quicker than you think. This can leave you expecting a house full of guests with nary a Christmas decoration in sight. Don’t fret. Get creative. We’ll even show you how. Christmas Night Inc. gathered up a handful of last-minute Christmas decoration ideas you can implement in a jiffy. Maybe you have some glittery bulbs stashed in the basement somewhere, or you can make a fast trip to the store or have a few boxes delivered quickly. Bulbs and other Christmas ornaments can be hung, strung, placed and propped just about anywhere around the home to create a festive look. Weatherproof Christmas ornaments can grace outdoor trees or shrubs, while those meant for indoor use can add a holiday touch in any number of creative spaces. Try hanging Christmas bulbs and ornaments in your front windows, from light fixtures or chandeliers, around the bannister, in the center of your front door, or even around interior doorframes. A batch of Christmas bulbs can also make striking centerpieces for the dining table, or holiday décor for end tables. Simple pick several holiday bulbs that share a common theme, them place them in a decorative bowl or vase. Christmas lights add instant ambiance to your space, and strings of them can be quick and easy to install. Gather up several strands of holiday lights, then use thumb tacks to secure them around windows and doorframes. Drape them generously across the mantel, down the bannister and around picture frames. String lights also make a striking statement when gathered inside Mason jars, vases or other glass containers that let you see the glow. Bookcases, cabinets, desks and mirrors are also work as places to drape strands of Christmas lights. Like holiday lights, Christmas greenery has the power to decorate your place in a flash. Go for long lengths of garland you can wrap around the same type of areas you can hang lights. Spruce up the greenery even further by including a few evergreen boughs and wreaths. Tree boughs don’t have to be covered with pine needles to be festive. You can make your own mini tree decorations using sticks. A single larger stick can work as a mini tree on its own. Simply place it in a heavy vase and add lights and ornaments as desired. Smaller sticks can be arranged in vases in batches, and again adorned with ornaments and lights. Stones can take on the role of Christmas décor if you paint them with festive colors and designs. Use acrylic paint or paint markers to decorate rocks you can then place in strategic areas around the home. Line them up along the fireplace mantel, place them in a decorative bowl, or arrange them in a circle in the center of the table. Even better, you can gift your painted rocks as stocking stuffers or as a parting present for your guests as they leave. Candles of any shape, size, scent or color can contribute to dazzling Christmas candle display. Once you round up your existing candles, or purchase several you can acquire quickly, arrange them into groupings. Perhaps one group is all white candles, while another features candles of all the same size. Glam up the candles by placing a small ornament on each candleholder, and place each group of candles on its own decorative tray. You should now have several warm and cozy collections of Christmas décor to place around your home as desired. No time to go out and get a Christmas tree? Why not try building your own. Take a look around your home and garage to see what types of materials you may have handy. Then build a tree with what you find. Options may include a wire sculpture Christmas tree or a tree that features rolled-up brown bags or paper as branches attached to an old broom handle. Some of the more creative DIY Christmas trees we’ve seen include one created out of a stack of books and adorned with lights, several made out of glued-together sticks or planks of upcycled wood, and a Christmas tree made out of a ladder. Simply place a ladder in a highly visible area, wrap it with lights and dangle several ornaments from the light strands and ladder frame. Whether you want to quickly spruce up your home with holiday décor to impress your guests or for your own enjoyment, these last-minute Christmas decorations have you covered. Try one, two or combine all of the ideas to having your house feeling a lot like Christmas in no time at all. For future reference, you can also order Christmas decorations from Christmas Night Inc. all year long so you’ll be set with plenty of time to spare for next year. The winter holidays are a festive season and the holiday party is a popular way to celebrate with family, friends and co-workers. While everyone enjoys showing up at holiday parties, planning and hosting one is a big responsibility. Because a holiday party is a once a year event, everyone expects it to be relaxing and fun. So, how do you ensure your holiday party meets those expectations? Follow the tips and suggestions in this guide to make your holiday party a memorable one. Before you do anything, crunch the numbers and come up with a budget for your holiday party. This helps you stay within a certain monetary range as you make spending choices. Also, a solid budget can help you save money by considering the cost of items on your party list before you spend a dime. Keep in mind that spending lavishly doesn’t equate to a successful party. Spending wisely and making good choices is the way to approach your budget for this event. Start your party planning in earnest by putting together a guest list. This list includes names and contact information. Email is faster, but it’s important to make sure the subject line mentions holiday party, so people open it. Or, you can stick with the classic mailed party invitation pairing a paper invitation with a matching envelope. Asking invitees to RSVP can help you figure out attendance numbers well in advance. Avoid conflicts by sending invites out two to four weeks ahead of the party date. Setting a party date requires some thoughtful consideration of the busy season. Fridays are the most popular date for workplace holiday parties, and this makes sense because employees can relax, knowing there’s no work the next day. Alternative days are Wednesdays and Thursdays. Start times tend to be around 2 p.m. or 3 p.m., but parties can start earlier or later, depending on the workplace. Weekends are ideal for parties hosted at someone’s home. Home parties can begin in the afternoon or early evening. Ideally, the day and time should work for most people on the guest list. Once you’ve settled on a date and time, and you have a rough idea of the number of attendees, go ahead and secure an event space. This is easy if you plan on hosting the party in your home. You already know if you can use your living room, dining room, garage or other space for your party. However, if the party is for work or an organization, you can choose to host it on-site or at an outside venue. Either way, do whatever is necessary to reserve your desired space as quickly as possible. Remember, others are also planning parties, and spaces get booked rather quickly. If you plan to use an event venue or restaurant as your party space, consider booking the space more than a month in advance. Also, have backup spaces in mind, just in case your first choice is unavailable. The last thing you want is to have to settle for a less than desirable location because there’s no other good choices. There’s no rule that says one person must do everything related to throwing a holiday party. In fact, this may be too stressful for just one person. Instead, divvy up responsibilities among two, three or more people to make planning go quicker and smoother. This can be something like person A takes care of securing a location and getting decorations. Person B does food and entertainment, while person C oversees party set up and cleaning tasks. There are two ways to go when it comes to food for parties. You can be formal or casual. Formal settings usually involve a sit-down dinner with dining tables adorned with classy tablecloths, dishes, utensils and holiday centerpieces. Casual affairs feature buffet style food choices, which lean heavily on easy-to-handle foods and snacks. Whether you desire a formal or casual setting, you can go one step further by deciding how food is presented. Build your own food bar. This popular trend involves setting up tables (food bars) featuring foods that align with a certain culinary theme. Guests are given numerous choices and they can build their plates by selecting whatever foods they wish, just like a buffet. Food bar ideas include fruit or vegetable salads, desserts such as donuts, cookies or cheesecake, nachos, hot dogs and sandwiches. Classic catering. Hire a local caterer to provide food for the party. Contact various caterers and ask about their holiday menus. Some caterers may also offer food bar options. Pot luck. Send party invitees a list of food items and ask them to volunteer to bring items on the list. Require them to tell whoever’s in charge of food planning what they intend to bring, so planners can ensure there’s enough food variety. Leftovers. Food costs money, and one way to ensure it doesn’t go to waste is to supply guests with Chinese take-out boxes for leftovers. It’s not a holiday party without festive decorations. Envision how you want the space to look and find decorations that help you create an uplifting atmosphere. This may include indoor and/or outdoor decorations. Decorative lighting. LED lighting brightens any room or outdoor home or building. You can hang strings of twinkling lights near the ceiling or install holiday character lights outdoors as a fun way to greet guests. Creative displays. Create festive displays using holiday table top characters or use life-size Santas, elves, gifts and candy canes to wow guests. Large displays are great for group pictures and selfies. The magic of Christmas really comes alive when you turn your ideas for a holiday wonderland into reality. With a bit of ingenuity and access to life-size, jumbo and giant holiday décor pieces and sets, you can create a holiday masterpiece that causes people to stop and gaze upon your holiday display with delight and wonder. To help spark your creative imagination, here are some ideas for creating your own larger than life displays. 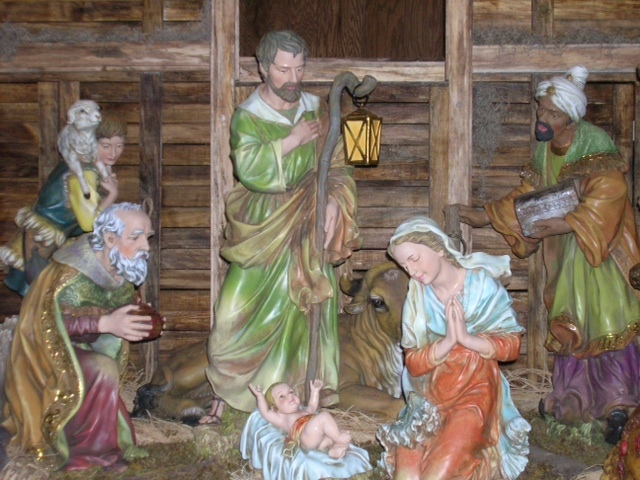 Nativity scenes are common during the holiday season, and if you’re seeking to create an authentic nativity display, consider making one that stands out in a special way. 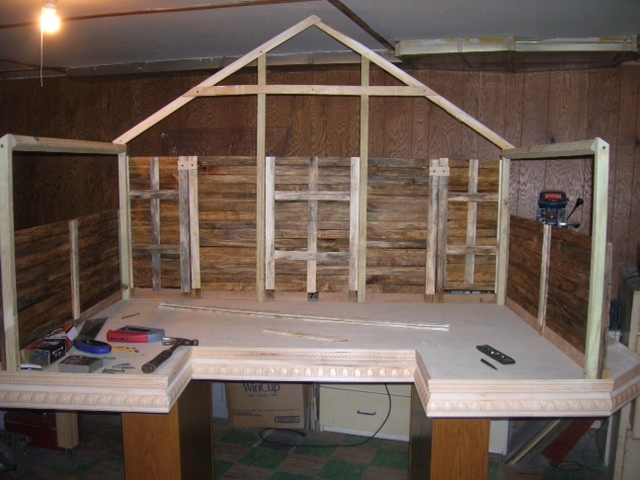 Go big with a well-constructed manger made from real wood as your backdrop. Kick things up a notch with a gleaming Star of Bethlehem to remind viewers how those wise men found their way to the manger. After selecting the backdrop pieces, choose your desired life size biblical characters to fill out the scene. 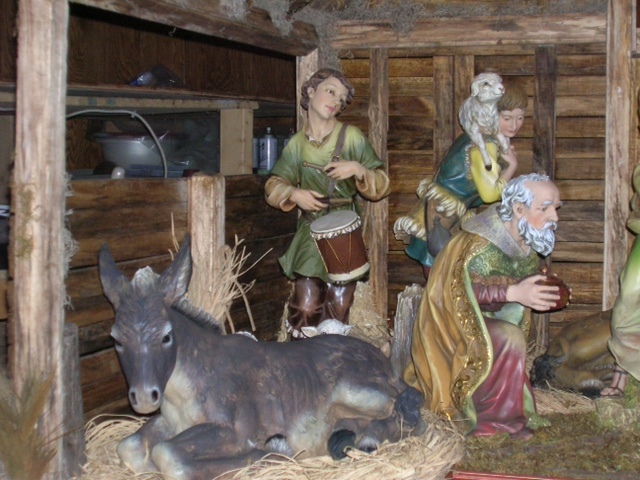 The three main characters are baby Jesus, Mary and Joseph, and you can also find life-size renditions of the wise men, angels, shepherds, the drummer boy and barn animals such as donkeys, sheep, cows and camels. Arrange these character pieces anyway you wish. 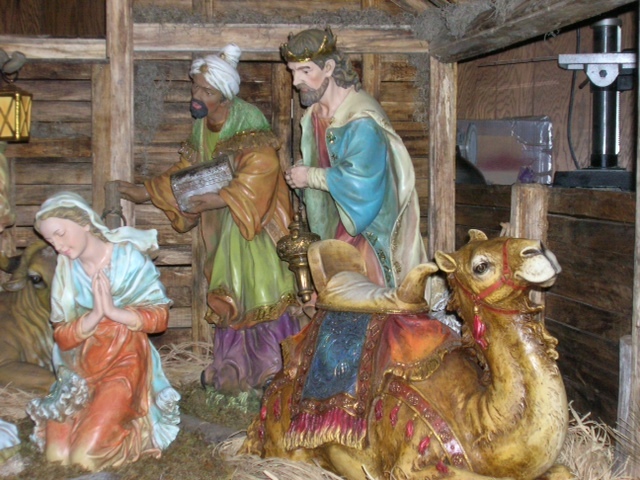 For added realism, scatter some decorative bale straw around the interior of the manger piece. If the nativity display is outdoors, lighting them with outdoor spot lights ensures everyone strolling by can easily see this endearing biblical scene. Santa Clause is a larger than life figure in many holiday stories, so why not make him a big focal point for your wonderland display? Santa Clause Village is a popular theme for life-size displays, and it’s sure to grab the attention of kids and adults who get a kick out of seeing a realistic Santa figure. There are various ways to showcase jolly ol’ Santa. He can stand upright with hands on hips, or he may wear an amused look on his face while holding a bag of toys. You can choose a Santa who cheerily waves to everyone who comes to your location. Or, you can choose a sitting Santa who is ready to steer his reindeer to houses all over the world. Of course, Santa always has his helper elves nearby, and you can find adorable elf figures that work hard to make the holidays a happy time. Santa also needs his sleigh and trusty flying reindeer to help him deliver his gifts to far away homes. The neat thing is that Santa is instantly recognizable, which makes him a winning subject for any holiday wonderland theme. Another idea is to recreate a quaint Victorian era village filled with old-fashioned charm. Movies about Scrooge, the grumpy man who hated Christmas until he discovered he loved it, can provide inspiration for showcase displays. For instance, you can build your scene around a group of vintage Christmas caroler statues singing near a lamp post. From there, you can add other characters such as merry snowmen wearing colorful hats and scarves. Further enhance your village with Christmas tree and light displays, and perhaps, a beautiful angel who graces the village with her angelic presence. Your vision for wonderland may take a whimsical turn, using fun life-size statues that appeal to kids and adults. While various treats are associated with the holidays, candy canes are iconic and instantly recognized as a Christmas treat tradition. How about posting two giant candy canes at the entrance to wonderland? These red and white cane-shaped statues look good enough to eat. Along with candy canes, you can find large-size gift boxes wrapped neatly with bows, and these can be placed near a Christmas tree, elves or Santa himself. Gift box decorations come in single pieces and sets, allowing you to mix and match different colors and sizes. Many people enjoy watching the story of the Nutcracker come to life during the holidays. Imagine the looks your display will get when onlookers spot a life-size Nutcracker King and Nutcracker soldiers (or toy soldiers) under his command. Their sharp uniforms are reminiscent of those seen in ballet and movie productions of this timeless fantasy tale. These classic figures fit nicely in numerous wonderland themes, including Victorian and upbeat themes featuring candy, gifts and toys. So much can be done with decorative Christmas lights these days, and there are several ways to use them to enhance your wonderland theme. Because anything goes, you can use one or several lighted displays featuring white, warm white or colorful LED lights. Santa. Make Santa Clause visible at night with lighted Santa Clause display sets. This may be a single image of a jolly Santa holding his bag of toys or a lighted display that shows Santa and his reindeer heading into the night to make their annual deliveries. Stars. Lighted stars are often associated with large nativity displays, and a brilliant Star of Bethlehem helps re-create the wonder of the original Christmas story. Stars also make wonderful visual accents for traditional Christmas tree wonderland themes. Trains. There’s something mesmerizing about trains and adding a fun lighted train to your display captivates the young and young at heart. Signs. Give everyone viewing your wonderland display a positive seasonal message that is visible day and night with a lighted sign. Lighted signs are easy to see from the sidewalk or road, helping you spread warm wishes 24 hours a day. Make your North Pole wonderland something uniquely special with the addition of life-size display animals. Animals that are associated with wintry climates include penguins, grey and white husky dogs, Nordic reindeer and polar bears. These animals add realism to any holiday scene you wish to bring to life. Alternatively, whimsical animal decorations can be charmingly fun when used with lighthearted themes. Historic St. Anne’s Church in Waterbury, CT. suffered two fires in the 1970s. Gorgeous stained glass windows were lost. Smoke damage was extensive. Spectacular, colorful life-sized statues were beyond recognition. The devastation continued when the church learned that insurance money would cover only a fraction of the costs. Enter Scott Whipple: local artist, painter, builder, restorer and philanthropist. “I was overwhelmed… intimidated,” he said, at the thought of restoring any of St. Anne’s life-sized statues. Scott had never worked on anything so large. But he jumped right in, starting with a smaller statue of St. Francis of Assisi and working his way up. Baptism by fire. Everyone – clergy and parishioners – loved his work so he kept on going. Fast-forward a few years and a few miles to his current project: The Blessed Sacrament Parish, also in Waterbury, CT.
His focus: the church’s Christmas scene. 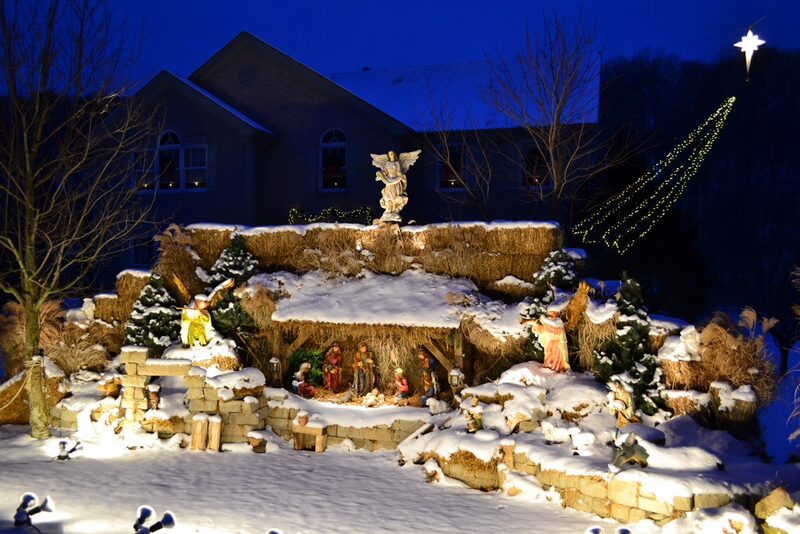 “I had heard that nativity set that they set up every year was really tiny with mismatched pieces,” he says. He knew he couldn’t fix the figures with his own two hands it so he took a different route with his generosity. He then bought lumber and began building a manger. With a handyman’s skill he set up interior lighting. Wanting the beautiful display to be eye-level, he restored an old altar table from St. Anne’s so the figures could sit on the table itself rather than on the floor. The idea is that people won’t simply look at the scene of the birth of Christ, but rather step right into it. The viewers will actually stand under the stable’s roof. “You become part of it,” Scott says. Hard to think of a better way of celebrating Christmas than by becoming part of it. Like many companies selling directly to consumers, we offer easily accessible and useable product information, shipping information and pricing combined with timely email notifications at each step. Our company rule is to treat the customer the way we would like to be treated. Occasionally, we have problems with parts of our system which frustrate customers as they would frustrate anybody and we do our best to solve the problem while keeping in mind what the customer really wants, which is not excuses, but a sincere apology, an explanation of the problem and assurance that the problem has been resolved. Comments: Hi. I would like to know why my order is “on hold”? What does that mean? 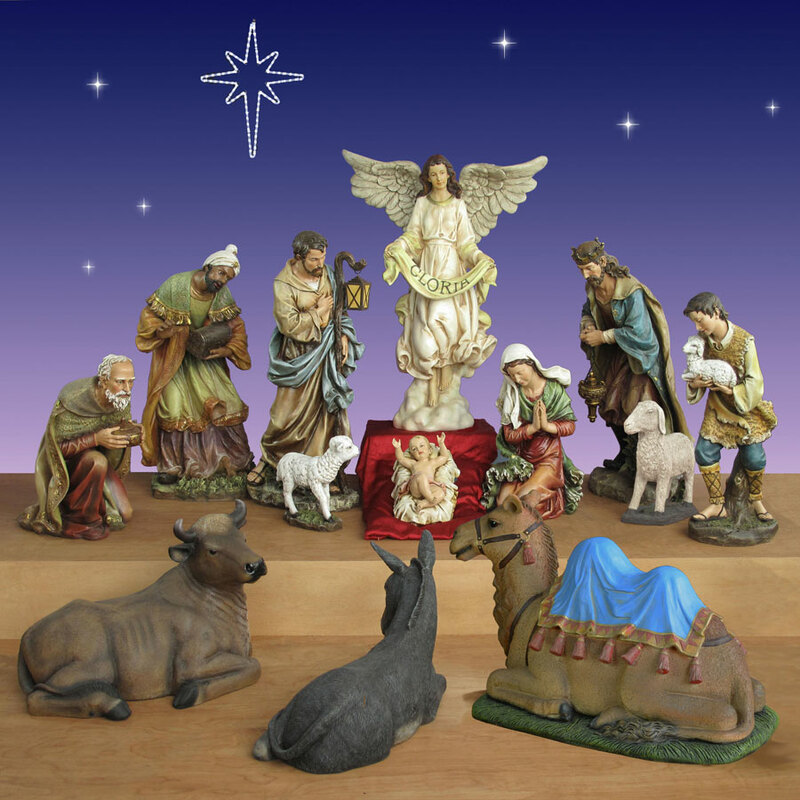 I ordered the nativity pieces with the understanding they would be shipped within 1 business day. It took me over a week to get the shipping calculator to operate correctly, so I could order the items. It kept saying “retrieving quotes”. I quit trying after a hour of waiting for it to retrieve a quote after each time. I finally had success with it on Monday. Thank you. Our apologies for our poor communication, both for not replying to your email and for the difficulties you had with the shipping prices and then the HOLD. The later is an internal designation which says your order has been tagged for immediate shipping. It’s not something we intended for you to see. The late reply and shipping problems were mail server and software problems which have been corrected. We hope your order arrived in good time and in good condition. Thank you for shopping at Christmas Night. Thanks so much for your reply. My items did arrive in a timely fashion and in good condition. Last year I bought the Holy Family pieces from another website but I found your website last spring and enjoy the fact that it is a website where complete nativity collections are sold, as a set and as individual pieces. I just wanted to make you aware of the issues I was having with your website. I figured it was probably a website server issue, since I tried on 3 computers and my smartphone over a week. The pieces are beautiful and it was worth the initial frustration. 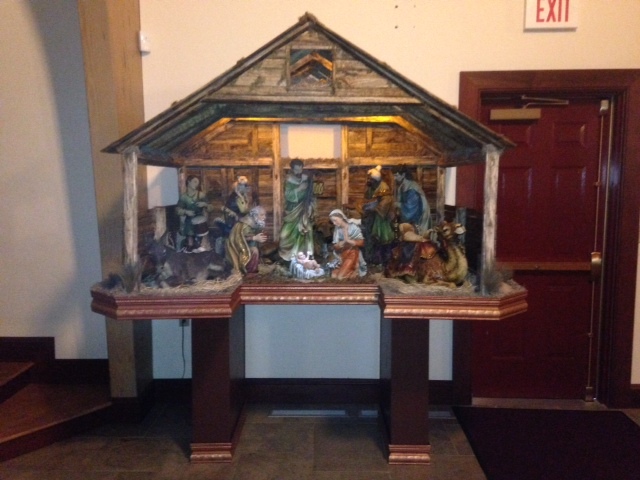 I plan to order other pieces for the Joseph Studios 40-inch nativity. Next year I plan to order the angel and shepherd, which requires special shipping quotes, so I am sure we will be in contact with one another again. I then will order the 3 wise men and camel the following year. Thanks again for your apologies and explanations. Excellent customer service. Customer service doesn’t finish when the product is delivered!